When Victor Collins was murdered, sometime between the hours of 1 and 3 AM, it is believed to have happened in the home of one James Andrew Bates, of Bentonville, Arkansas. Police have arrested Bates for the murder, and are actively looking to put together a criminal case, and there’s believed to be only one possible witness. That witness is an Internet of Things (IOT) device and media server called the Amazon Echo. 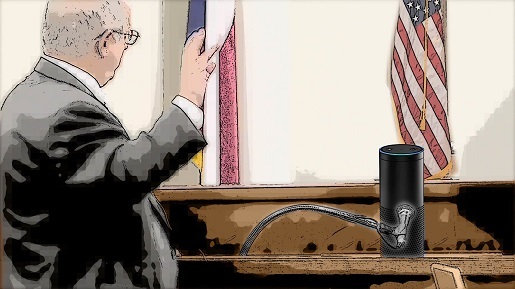 Police are trying to get Amazon Echo records in a murder trial. “You have an expectation of privacy in your home, and I have a big problem that law enforcement can use the technology that advances our quality of life against us,” argues Bates’ lawyer, who is seeking to keep police from accessing the Echo’s records. That’s the issue with the Amazon Echo. It records sounds when cued to do something like stream entertainment, and sometimes the device can be triggered to record accidentally. Police want to access the Echo’s records on Amazon’s servers, but Amazon isn’t currently cooperating with the authorities, citing privacy issues and a need for a warrant. Police have already accessed the records of several other smart devices in the Bates home, including the hot water heater, which may have been used to wash away murder evidence.